Patrick Müller’s Switzerland conceded a 1-1 draw against Italy. The Lyon defender was absent as precaution after getting a knock on his ankle against the Côte d’Ivoire last Saturday. 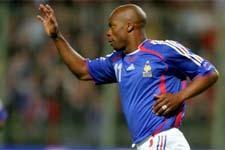 Florent Malouda and Eric Abidal produced more quality performances with Les Bleus in the 2-0 win over Denmark, while Sylvain Wiltord, introduced in the 66th minute to replace Louis Saha beat Danish ‘keeper Christiansen from the penalty spot after Franck Ribéry was brought down in the area. Brazilian Juninho was a luxury sub against FC Lucerne for the Seleçao, but still got tongues wagging with a stunning free-kick from wide on the left which found the top right-hand corner. Fred and Cris are yet to feature in the team’s warm-up matches. The Stade Félix-Bollaert will host more France action on Thursday at 15:00 when a UNFP Eleven takes on a France side featuring players which have not seen much playing time in the last two friendly games. Former Lyon players Christophe Delmotte and Pierre Laigle are in the UNFP XI. With the France Under-21 side Jérémy Toulalan, François Clerc and Jérémy Berthod are qualified for the semi-finals of the European Championships, where they will face the Netherlands on Thursday at 18:00.